Tokina used Photokina 2018 to tease us with what will be the third lens in its Firin family. Arriving in 2019, the Tokina Firin 100mm f/2.8 FE AF Macro will be designed to fit Sony E-mount mirrorless cameras. The full-frame macro lens will offer 1:1 image magnification. The first two lenses in the Firin series were the Fírin 20mm F2 FE MF and Fírin 20mm F2 FE AF – manual-focus-only and autofocus lenses of the same prime design. 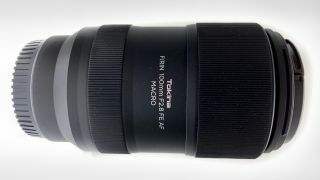 The Firin 100mm FE AF Macro will be an autofocus lens. Other specifications were not released at the show, and the protototype lens was only shown hidden within a glass lens. The lens is not expected to go on sale until late 2019. The word Fírin is apparently a variation of Fírinne, the gaelic word for "truth". Tokina explains this 'represents a promise from Tokina to photographers to help them capture the truth in their images'. Tokina also used the Photokina show to launch its Opera range of lenses for full-frame DSLRs, starting with the imminenet arrival of the 50mm f/1.4, which will be followed by a 16-28mm f/2.8 next year.